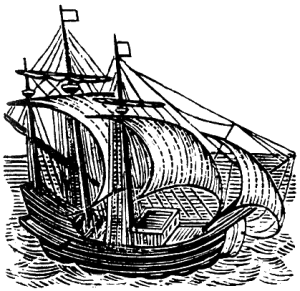 After the Mayflower, the next ship to land at Plymouth was the Fortune, which arrived in November 1621. 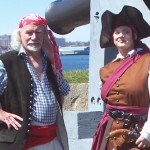 Aboard the Fortune was Philippe de Lanoy, a cousin of Pilgrim John Cooke. Upon his arrival in America, de Lanoy first lived in the home of his uncle Francis Cooke in Plymouth. In 1634, de Lanoy married Hester Dewsbury in Duxbury, where the couple settled. Philippe de Lanoy was one of the 36 colonists who purchased the Dartmouth territory from Wampanoag chief Massasoit in 1652. 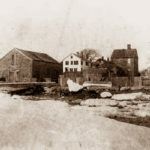 The de Lanoys’ seventh child Jonathan Delano, born in 1647, settled in Dartmouth on the east side of the Nasketucket River in what’s now East Fairhaven sometime before the King Philip War. During that war he served under Captain Benjamin Church. Reports indicate that there were about 30 homes in old Dartmouth at the time, all of which were burned by the Indians. During the resettlement of Dartmouth following the war, Lt. Jonathan Delano married Mercy Warren on February 28, 1677/78. She was a granddaughter of Richard and Elizabeth Warren and a niece of John Cooke’s wife. All of Lt. Jonathan and Mercy Delano’s 13 children were born in what’s now Fairhaven between November 1679 and May 1704. Lt. Jonathan Delano’s public life in old Dartmouth included service as Deputy to Plymouth Court, Surveyor, Constable. He was a Selectman from 1686 to 1690. He died December 28, 1720, in his seventy-third year, and is buried with a marked stone in Acushnet Cemetery, in Acushnet, MA. Two U.S. Presidents, Franklin Delano Roosevelt and Ulysses S. Grant, descended from Lt. Jonathan Delano. Other descendants include author Laura Ingalls Wilder, astronaut Alan B. Shepard, and industrialist and Fairhaven benefactor Henry H. Rogers. Jonathan Delano, oldest son of Lt. Jonathan Delano, was born on January 30, 1680. On June 20, 1704, he married Amy Hatch. Their daughter, Susannah Delano, married Noah Grant. Noah and Susannah (Delano) Grant were great grandparents of President Ulysses S. Grant. Capt. Ephraim Delano (1733 – 1815) He was one of the original investors in the “Twenty-Acre Purchase,” which developed into the village of Fair-Haven. In 1760, he married Elizabeth Cushman. He served as a private during the Revolution. Capt. Warren Delano I, (1779 – 1866). A shipping merchant, he was twice captured by the British during the War of 1812. About 1832 he had the Delano Homestead built at 39 Walnut Street. Along with his cousin Jabez Delano Jr. and Joseph Bates Jr., Warren Delano I oversaw the building of the Washington Street Christian Meetinghouse, which evolved into the Unitarian Church. The next year Warren Delano I, Jabez Delano Jr. and Samuel Borden built a candleworks and whale oil refinery at Middle Street just north of Washington Street. 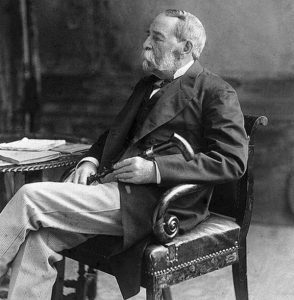 Warren Delano II (1809 – 1898) Warren Delano II amassed a fortune as a partner in Russell and Company, America’s largest firm engaged in the China Trade. He and his brother “Ned” were in Canton at the time of the Opium War. He created Riverside Cemetery in 1850. In 1893, Warren Delano II saved the Fort Phoenix cannons from a potential out-of-town buyer. In 1843, Warren Delano II married Catherine Robbins Lyman. Their seventh child, Sara Delano, who was born September 21, 1854 at the Delano estate near Newburgh, NY, became the second wife of James Roosevelt on October 7, 1880. The son of Sara and James Roosevelt, Franklin Delano Roosevelt was born January 30, 1882 at Hyde Park, NY. That summer, young FDR came to Fairhaven on the first of many visits. 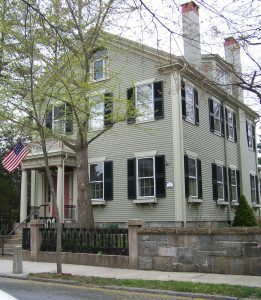 Built about 1832 by Warren Delano I on land purchased from the Rotch family, the Delano Homestead, 39 Walnut Street, Fairhaven, remained in the family for about 110 years. (An earlier home was on the southwest corner of Washington and Middle streets.) Additional wings were added onto the house subsequently, but were removed and remodeled into self-standing homes following the sale of the property in 1942. FDR’s first visit to Fairhaven was during the summer following his birth in 1882. Notably, it was here in 1903, following Thanksgiving dinner, that Franklin announced to his mother that he had become engaged to (Anna) Eleanor Roosevelt. The last visit to the Homestead by President and Mrs. Roosevelt came on October 21, 1936. The couple dined with the President’s mother Sara, who had arrived in town the night before. 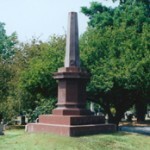 Riverside Cemetery on Main Street, Fairhaven, was created by Warren Delano II on land he had purchased in the winter of 1846-47. It was dedicated on July 7, 1850. Capt. Warren Delano I was elected first president of the Riverside Cemetery Corporation. The lovely rural or garden style cemetery is the site of the Delano family tomb, designed by architect Richard Morris Hunt and built about 1859. Other prominent citizens interred at Riverside include Captain Nathaniel Pope, Captain William H. Whitfield, Henry H. Rogers and renowned marine artist William Bradford. Capt. Jabez Delano Jr. (1799-1874) A grandson of Ephraim Delano, Jabez Delano Jr. was a commander of whaleships, including the Oregon and the Amazon, and the owner/agent of other ships. 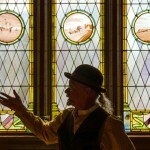 He owned a ship chandlery, a settlement house and was co-owner of whale oil refinery and candleworks at Middle Street. With Noah Stoddard and Joseph Bates Jr. , he incorporated the Proprietors of the Washington Street Christian Meeting-House in 1833. The following year he served as a Selectman for the Town of Fairhaven. He was also interested in poetry, philosophy, science and astronomy. Jabez Delano Jr. was a firm believer, in the 1850s, of inhabitants of other worlds, yet undiscovered, and their superiority to those here on earth. He was the son of Jabez and Deborah Delano. He married Elizabeth S. Terry in 1836. Elizabeth T. Delano (1845 – 1933) The daughter of Jabez Delano Jr. and Elizabeth (Terry) Delano, Elizabeth T. Delano was an accomplished painter noted for her floral studies. 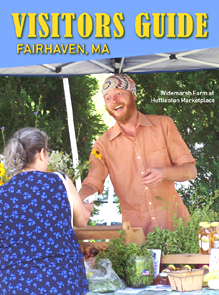 Examples of her work may be viewed at the Fairhaven Town Hall. A letter to the editor of the Fairhaven Star written by Elizabeth Delano in 1918 indicates she was a strong supporter of women’s suffrage. According to another Fairhaven Star article published the week before the 1932 Presidential election, Miss Delano, a staunch Republican, intended to vote for Herbert Hoover, not for her cousin Franklin. Frances Jackson Delano (1857- 1934) The daughter of Jabez Delano Jr. and Elizabeth (Terry) Delano, Frances J. Delano was the author of children’s books, magazine articles, and poetry. After graduating from Fairhaven High School in 1875, she studied at Northfield Seminary and Wellesley College. Her books included Susanne, L.C. Page & Co., Boston, 1902, which was part of the popular “Cozy Corner” series and Polly State, One of Thirteen, Pilgrim Press, Boston, 1902. Milton K. Delano (1919 – 1989) A descendant of Lt. Jonathan Delano’s 10th child Nathaniel, Milton K. Delano was a noted scrimshaw artist. A large whale tooth engraved with the Presidential seal by Delano was a gift to President John F. Kennedy from his wife Jacqueline on Christmas day, 1962. It was buried with Kennedy following his death. Paintings and drawings by Milton Delano are on display at the Fairhaven Historical Society Museum at the Academy Building/Visitors Center. 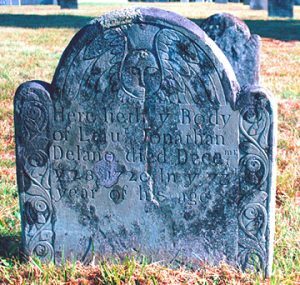 The 1720 headstone of Lt. Jonathan Delano is located in the oldest section of this cemetery. Originally called the New Bedford Academy, this was a private school built in 1798. In 1824, 15 year old Warren Delano II graduated from here. In the Academy today is the town’s Visitors Center and the Historical Society museum, which houses some Delano artifacts and artwork. Warren Delano I built this house about 1832. It remained a family gathering place until it was sold by Frederic A. Delano in 1942. During his youth, President Franklin Delano Roosevelt stayed here frequently. He announced is engagement to Eleanor here on Thanksgiving 1903 and made his last visit here on October 21, 1936. The house is now a Bed and Breakfast. Warren Delano I along with Jabez Delano Jr. and Joseph Bates Jr. oversaw the financing and construction of this church building in 1832. It later evolved into the Unitarian Church. 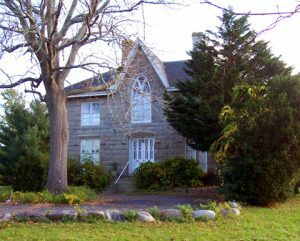 This stone gothic style home was built in 1850 by Jabez Delano Jr. a cousin and business partner of Warren Delano I.
Warren Delano II created this lovely rural style cemetery in 1850 and his father was president of the cemetery corporation until 1861. In 1859 the Delano tomb, designed by architect Richard Morris Hunt, was installed on the south side of the cemetery. Most of the descendants of Warren Delano I are buried here.